Adhesive bonding technology allows dentists to bond porcelain veneers of minimal thickness to an anterior tooth; these veneers will not break under normal masticatory function. The technique maintains long-lasting restorations with high survival rates for porcelain veneers (94% at 10 years and 53% at 20 years). However, failures may occur due to chipping or fracture (more than 50% of failures), discolouration, and less frequently to recurrent caries. Sixty-seven percent of reported fractures are due to cohesive failure of the porcelain incisal edge. A fractured veneer compromises esthetics and can have sharp edges/rough surfaces that might cause the patient discomfort. Ask the patient how the veneer was fractured and look for parafunctional habits (bruxing and/or clenching). Perform an intraoral examination to diagnose what may have caused the fracture, paying special attention to the occlusal contacts on protrusive and lateral excursions. A diagnosis of a fractured porcelain veneer is based on discussions with the patient and the intraoral examination. Treatment largely depends on the extent of the porcelain veneer fracture. Small chipping may be corrected through recontouring and polishing. Larger fractures usually require replacement with a new veneer. However, repairs can provide a temporary solution, depending on whether the patient has the fractured veneer pieces. Remove the cement from the tooth and/or the internal surface of the veneer with a rotary instrument. In some cases, it may be impossible to remove cement from the internal surface of the veneer without causing significant damage to the veneer. These cases should be treated as if the patient does not have the fractured veneer pieces with them. If resin cement removal is difficult on a veneer fragment, the cement could remain but needs to be acid etched or microetched (sandblasted). The cleaned piece should be tried in to ensure a good fit. To achieve proper fitting prior to re-cementation, the piece should correspond with the fracture line. Produce a 45° bevel in the porcelain around the area to be repaired. Clean off the internal surface of the fractured porcelain and microetch it with silica-coated aluminum oxide particles (50mm). Etch the microfractured ceramic fragment for a minute with a 9-10% buffered hydrofluoric acid gel. Suction the acid gel and then rinse with a copious amount of water and air dry. The surface should appear dull and frosty. Apply silane coupling agent mixture and allow to dwell for 30 seconds. Dry with an air syringe. Etch the exposed tooth preparation for 15-30 seconds with 35-38% phosphoric acid. Apply a silane coupling agent to the etched ceramic surface of the intact veneer and lightly air dry. Apply bonding resin over ceramic surface and tooth structures as per the manufacturer's directions. Apply adhesive on veneer surface and lightly thin it out with air. Place light-cured resin cement onto the internal surface of the fragment and seat over the tooth structure. Eliminate the excess cement with a microbrush and polymerize under light pressure to seat the fragment for a total of 60 seconds from all aspects: facial, lingual and incisal. If the porcelain fracture extended to an interproximal area, you can use a matrix strip when bonding and interproximal finishing strips to remove excess resin cement and polish. Remove marginal flash with fine needle diamond or multi-fluted carbide finishing burs used in high-speed handpiece with water spray, then use polishing points/discs/paste to add lustre to the surface. Remove the remaining portion of the veneer, refine preparation and take an impression to fabricate a new replacement veneer. If the fractured portion was small then repair it by adding resin composite freehand. This will require roughening the enamel surfaces with a medium-grit, needle-shaped diamond bur to remove cement remnants and expose fresh enamel for optimum bonding. Phosphoric acid-etching and bonding follows before the resin composite repair is completed. This can be done freehand. Consider a mouth guard fabrication, if bruxing is suspected. Council patient concerning foods and habits that may fracture porcelains. Case selection: Cases should be carefully assessed for veneers versus full crowns. Preparation design: Clinical proficiency should guide the preparation technique based on the pre-operative assessment of the case. Ensure that preparation depth does not exceed 0.5 mm in order for it to remain in enamel. This is crucial to guarantee proper retention and longevity. However, with worn, misaligned, and fractured teeth, much of the preparation will be in dentin. There is no strict consensus on different incisal end tooth preparations (overlap, window or 45° bevel). However, incisal reduction is preferred for esthetics and strength of the veneer. Ceramic Material: You should choose materials that allow the most conservative designs. Feldspathic porcelains, for example, are highly esthetic and can be fabricated in thin layers. Pressed or machined glass-ceramics can also be very translucent and have higher flexural strength (400 MPa), but require slightly thicker layers for adequate esthetic results. Technique sensitivity: Veneers cementation is a highly sensitive technique/procedure and attention must be paid to initial passive fit and isolation during cementation, and to proper cementation technique, including time and direction of curing. Occlusal adjustment: In a single fractured veneer case, check occlusion in both centric and protrusive position. Ensure that in protrusive position there is no occlusion on the incisal aspect of the veneer and contact is limited to the lingual aspect of the teeth. Bruxism, high biting force, consumption of hard and chewy food. Advise patient to wear night guard at night. Advise patient to avoid ripping chewy food and biting hard food. Dr. Afrashtehfar is research assistant, prosthodontics and restorative dentistry division, faculty of dentistry, McGill University, Montreal, Canada. He is also ITI scholar, division of fixed prosthodontics, school of dental medicine, University of Bern, Bern, Switzerland. Dr. El-Mowafy is head of the department of restorative dentistry, faculty of dentistry, at the University of Toronto, Toronto, Canada. El-Badrawy W, El-Mowafy O. 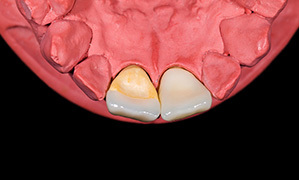 Comparison of porcelain veneers and crowns for resolving esthetic problems: two case reports. J Can Dent Assoc. 2009;75(10):701-4. Della Bona A, Kelly JR. A variety of patient factors may influence porcelain veneer survival over a 10-year period. J Evid Based Dent Pract. 2010;10(1):35-6. Reshad M, Cascione D, Magne P. Diagnostic mock-ups as an objective tool for predictable outcomes with porcelain laminate veneers in esthetically demanding patients: a clinical report. J Prosthet Dent. 2008;99(5):333-9. Fradeani M, Redemagni M, Corrado M. Porcelain laminate veneers: 6- to 12-year clinical evaluation--a retrospective study. Int J Periodontics Restorative Dent. 2005;25(1):9-17. Epub 2005/03/02. McLaren EA, LeSage B. Feldspathic veneers. What are their indications? Compend Cont Educ Dent. 2011;32(3):44-9. Gurel G, Sesma N, Calamita MA, Coachman C, Morimoto S. Influence of enamel preservation on failure rates of porcelain laminate veneers. Int J Periodontics Restorative Dent. 2013 Jan;33(1):31-9. Blatz MB, Sadan A, Kern M. Resin-ceramic bonding: a review of the literature. J Prosthet Dent. 2003;89:268-74. Magne P, Douglas WH. Design optimization and evolution of bonded ceramics for the anterior dentition: a finite-element analysis. Quintessence Int. 1999 Oct;30(10):661-72.